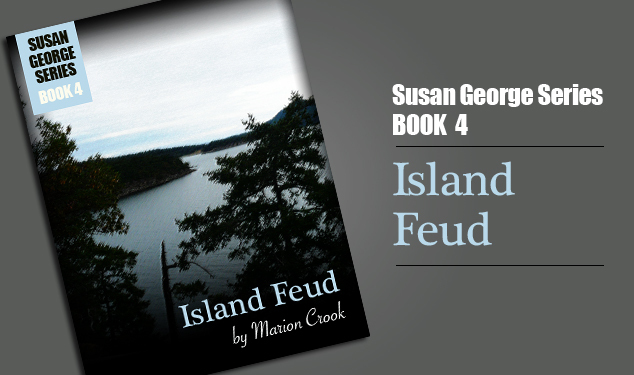 Susan George, that exceptional teenage sleuth, is happy to escape the mainland of British Columbia – and the pressure of a long-term romance. She has snapped up an invitation to stay on Carpenter Island to help her cousin Carol and Carol’s friend Eliot run a controlled feeding experiment with coho salmon. The problem isn’t the long hours and the enormous energy the fish farm requires, it is the attitude of many of the local residents; they are convinced the farm is polluting the waters off the island. And some of the them – one explosive character in particular – even try sabotage to close down the farm. With her usual energy and inventiveness, Susan decides to take on the islanders. Along the way, in the thick of the work, town meetings and hair-raising confrontations, she discovers that more than the farm needs rescuing…. …the story is fast paced and interesting. Crook’s writing is solid and the dialogue is natural.